Bajaj two-wheeler has just unveiled 2018 "Bajaj Avenger Street 180" at price of Rs 83,475 (ex-showroom Mumbai), Bajaj Avenger Street 150 is replaced by this model.New 180cc engine makes Avenger more powerful.Bajaj Avenger 180 is more budget oriented bike and affordable cruiser in India 2018.Maintenance and service cost is bit low as compared to other bikes in this segment.Bajaj Really takes initiative to provide a good product to India young consumer.Pusar RS200 and Pulsar NS is also good bike from Bajaj company.Although there is not that much difference of price between Bajaj Avenger 220 and 180. but if you have a shortage of few bucks then you can go for Bajaj 180cc variant. "Bajaj Avenger Street 180" comes with a price tag of Rs 83,475 (ex-showroom Mumbai) and On road price of this bike is around 92,149*.It can be varied according to State or Offers.This bike available in two colors Ebony Black and Spicy Red. It has a Single-Cylinder 2 Valve and Twin Spark 180 cc engine that produces Maximum Power 15.5 PS @ 8500 rpm and Maximum Torque 13.7 Nm @ 6500 rpm.This bike has 5-Speed gearbox.Overall power and torque are adequate for city and highway rides.Bajaj Avenger is one of the best cruiser bikes in Indian market.It has a 13-liter fuel tank capacity with 40-45 KMPL mileage figure(Depending on riding Style). Bajaj Avenger 180 has Tubeless Radial Tyres which is best for all types of road conditions.The front tyre of Avenger 180 is 90/70-17 and rear tyre size is 130/90-15.Front brake upgrades to 260 MM disc brake and the rear brake is 130 MM petal disc brake. Bajaj Avenger 180 is the most comfortable bike Segment.Cruiser bikes meant for long rides.Even though Some Cruiser bikes comes with a backrest and Soft seat to give maximum comfort during long rides.The riding position of hands and legs are just perfect.You will never feel any pain or Stiffness even you go more than 200KM.A good wheelbase always provides stability to the motorcycle. 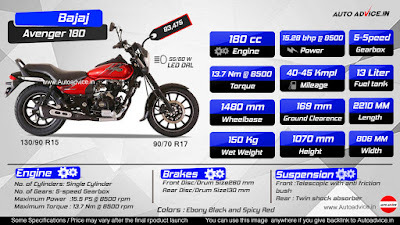 If you are looking for a comfortable bike on a budget.Then Bajaj Avenger 180 is much more you will get.We recommend you to take a test ride today to make sure that this bike is meant for you or not.Thousand of trusted customers are using this Avenger brand for many years.This is the only cruiser bike available under 1 Lakh price tag in India. Disclaimer: Some Specifications and price may vary after the final product launch.